The aim of this study was to determine the accuracy of crown diameter measurements by dental CT as a tool for preoperative diagnosis before tooth transplantations. Fifty-eight patients underwent clinically indicated dental CT. The diameter of the crowns were measured by CT using a standard protocol (1.5-mm slice thickness, 1-mm table feed, 120 kV, 25–75 mA/s, 2-s scan time/slice, 512 matrix) and a standard dental software package. Postoperatively, the same distances were clinically measured using a sliding gauge. The degree of the deviation between CT measurements and clinical measurements was in the sub-millimeter range. According to the regression analysis, the correlation coefficient equals 0.98 and 0.97, indicating a strong relationship between the CT and the manual measurement of the crown diameter in the bucco-lingual and the mesio-distal direction. 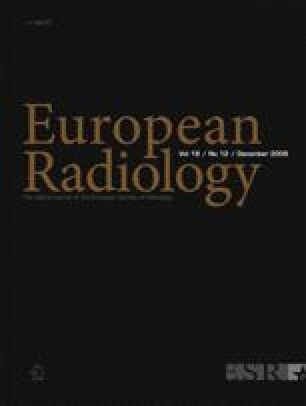 The mean deviation of CT measurements with regard to the bucco-lingual diameter of the crown was +0.08 mm (SD: ±0.38 mm). For the mesio-distal diameter, the mean deviation of CT measurements was −0.24 mm (SD: ±0.53 mm). These results demonstrate that dental CT promises to be a valuable tool for the evaluation of the potential and optimal size and site for tooth transplantations. We thank R. Gruber for the statistical analysis.